It’s a woman’s best kept secret. A first of it’s kind, it’s a fullness finishing spray transforms limp, lifeless hair into bouncy ‘Bardot’ in seconds. Apply similar to a dry shampoo. 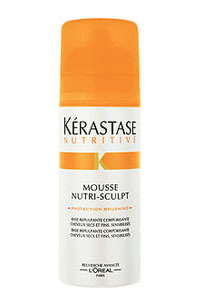 For a full body blow out, use Kerastase Nutri-Sculpt Mousse; helps keep hair protected while providing a smooth strong hold. Apply to towel-dried hair from root to mid-shaft and blow dry sections with a boar bristle round brush.